Pressure Regulating Unloader Valve - Used to set and maintain consistent system pressure. Rotate clockwise to increase pressure or counterclockwise to decrease pressure. Inlet Auxillery Port - Used for additional accessories such as an inlet filter or thermal valve. Drain Plug - Drain plug and oil filler cap can be switched to mount the pump 180 degrees. Oil Sight Gauge - Oil level should be in the middle of the sight gauge when the pump is not in operation. Pop-Off/Relief Valve - Used for secondary protection against over-pressurization. Thermal Valve - Used on closed loop by-pass lines to recycle water in event of excessive heat. Pressure Gauge - Used to accuratley monitor pump pressure. Inlet Filter - Used to capture and prevent contamination particles from entering and possibly causing damage to the pump and system components. By-Pass Hose - Used to route pump flow from unloader back to pump inlet when system is running in bypass. Used to accurately set and maintain system pressure as well as reduce load on the pump and motor when the system is in by-pass. Plumbed to the high pressure side of the pump manifold, preferably on a discharge port. Must be in line with the discharge hose. 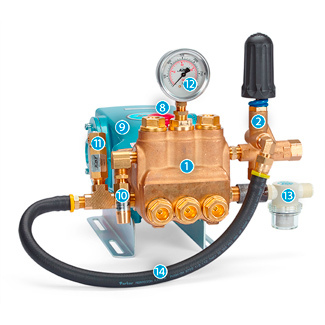 Provides your system with an accurate and reliable secondary pressure relief to protect your pump and system from damage caused by over-pressurization. 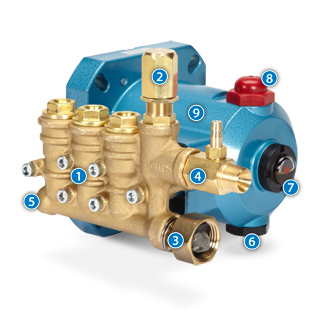 Plumbed to the high pressure side of pump manifold before primary regulating device or on an open discharge port. Set 200-300 psi above system operating pressure. Used to accurately monitor pump pressure. Plumbed to the high pressure discharge side of pump. If mounted before an unloader and there flow is stopped downstream, the pressure will be near zero. If located after the unloader the pressure will remain at the set pressure. Used to help provide smooth and consistent flow as well as increase overall system life. Reduces pulsation to 1-3%. Plumbed on the high pressure side of the pump and as close to the pump as possible for optimum dampening. If system uses an unloader where bypass flow is diverted back to pump inlet with a check valve or inlet regulator, the pulsation dampener must be plumbed after the unloader. Used to capture and prevent contamination particles from entering and possibly causing damage to the pump and system components. Plumbed on the inlet side of a pump near the supply tank or before the any other inlet accessories. 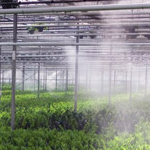 Used to relieve heat build-up in closed loop by-pass systems. Plumbed in the bypass line near the inlet port for optimum performance. Relieves discharge line pressure during system start-up when using pressure lock style unloader with gas/diesel engines. Plumbed in the high pressure side of the pump. When being used with an unloader, valve must be plumbed to discharge after unloader. Reduces engine wear and fuel consumption by lowering rpm while running in bypass. Plumbed in the by-pass line on a closed-loop system. Helps protect vented filler cap from weather and overspray. Mounted on crankcase oil fill cap.